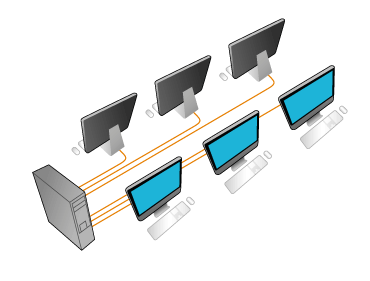 Why is it possible, that several user can work simultaneously at one PC? 1.The technical requirements of Windows XP/ 7/ 8/ 8.1 are brilliant to install a multiuser-system and to work with it. Windows XP/ 7/ 8/ 8.1 is, with its multithreading-tasking, prepared to handle fast with several tasks and programs at the same time. Thereby the operating system controlls all device and software services automatically. Same programs aren't loaded several times, but are taken from the electronic memory (cache) and are loaded much faster in the additional workstations. I.e. MS-Word needs the same loading time at the fist station as at a single user PC. Word is loaded in a fraction of this time, which is a advantage in a multiuser - enviroment. Today PCs have enough performance, i.e. Microsoft Word needs only 5-12% of the performance of a powerful PC. Therefore programs and files are edited intenally so fast (serial) that the respective user believes that the system is runing parallel. A standard PC updated with Aster hard- and software, which combines several workstations and a application server under Windows in one machine. As a matter of principle our solution works like a terminal server, but however with the fact that the server and the client are combined in one PC. Additionally there are the advantages of a single PC. Local or remote access on files and programs of terminal-serve. Conclusion: a multi user PC is the perfect combination and genius construction of all testet components (hard- and software). The installed mulituser hardware via software and assigns this to every single user, in other words every user gets his own input- devices (keyboard, mouse/touchscreen), monitor and optional sound. All other devices are availible for all users, if their drivers work under multiuser. Result: programma Aster intelligently manages the whole hard- and software with the time-slice multiplexer, multitasking, multiplexing mode (one after the other, but fast enough) in a exactly and shortly defined point of time. What is received using Multiseat software? the very stable 32-bit or 64-bit memory system of Windows. If an application does hang, you can shut it down in the task-manager without restarting the whole system. the preemptive multitasking system of Microsoft Windows XP/ 7/ 8/ 8.1.